You are not logged in. [Log In] Pond Boss » Forums » INTRO » Questions & Observations » Is it worth it??? #51696 - 02/14/05 06:08 PM Is it worth it??? Well I had the folks out from NRCS the other day to look at my two possible pond sites, nice folks by the way. My first choice was in a corner of my property and was going to be about a 3/4 acre pond. However due to my septic mound and the 100' easement, it has now shrunk to a bean shaped pond that would be crowded into the corner. The size would be about 100' long and 40-50' in the narrow saddle. Is this even worth building? The second site would be toooooo much $$$$$ and red tape. My goals are a place for the kids to catch a few fish(warm water species) and cool off in the summer. I don't need trophy bass, but would like to establish a natural and self sustaining environment. I don't want a giant koi pond that I have to babysit daily. So as a general rule, how small can a guy build a healthy pond? I live in the Pacific NW if that matters. #51697 - 02/14/05 09:29 PM Re: Is it worth it??? Hey Joe, darn right it's worth it. My small pond is on it's second winter now, 180ft x 50ft and it has been a source of enjoyment for both myself and my two young sons as well as a host of other children. I have all the natural elements, wildlife, birds, fish, frogs and the serenity that goes with it, just on a small scale. It's been my refuge since the day it was built. The trout are still there growing since the initial stocking. Maintenance for me is very little and easy to manage, (small ponds, small problems). It is different in my case with just rainbows that don't reproduce, hence no issues with overcrowding and stunting. Feeding will probably be necessary in your case, but that's part of the fun. I'm sure others here that are more familiar with southern species will give good advice on stocking rates and management techniques. I'm impatiently waiting for ice to come off, so I can once again enjoy the sights and sounds of pond life. But alas, June is still a long way off! Build your pond, whatever size, you won't regret it. #51698 - 02/15/05 08:00 AM Re: Is it worth it??? Sure is mine is about 180' by 80'. Went out last night and the fish are starting to feed good saw a couple of channel cats around 10 pounds gonna be a blast on the fly rod! You can see mine on my website. #51699 - 02/15/05 08:07 AM Re: Is it worth it??? Yes, its worth it...for those who love this sort of thing. Kids and grandkids not to mention yourself will get hours of enjoyment...and you will get to spend more money and time on Pond Boss Forum! #51700 - 02/15/05 09:20 AM Re: Is it worth it??? A friend of mine has a lake that is 50' X 100'. He had a very bad accident that caused significant brain damage. He and his wife bought a place in the country because he can't stand noise, lots of hussle and bussle etc. He now uses his lake to help other people with handicaps. In effect, he's made lemonaide out of lemons. A small lake like this does not support reproduction but I give him all the fish he needs. He receives and gives a tremendous amount of enjoyment from his small lake. #51701 - 02/15/05 01:45 PM Re: Is it worth it??? It sure is my pond is 1/2 an acre and has many average size fish. its easy to fish becauze of its size. Your kids could go swimming and catch fish very very easy. Trust me! a small pond beats a big pond anyday. With a small pond your upkeep will not be neccesary, and if it does it will be minimul. Stick with the small pond and good luck. #51702 - 02/15/05 03:01 PM Re: Is it worth it??? Not sure about that JD, spent hours last weekend raking out leaves spreading them on the bank and mulching them up and away from the pond! If it wasn't for my driveway running up the middle of the yard my pond would be heading north and getting bigger. Hey there is that 5 acres to the south of me that is nothing but woods humm wonder if the neighbor need a little capital for his retirement! #51703 - 02/15/05 04:30 PM Re: Is it worth it??? Hey Joe: if you haven't figured it out yet, you've basically asked a loaded question to a bunch of obsessed pond freaks (I mean "freak" in a good way). These guys can't look at a plot of land without imagining it covered with water. Hell, I'm carrying color printouts of smallmouth bass in my briefcase. #51704 - 02/16/05 01:01 AM Re: Is it worth it??? I am glad to hear such positive comments, it really helps to be able to ask an important question to such a targeted audience. #51705 - 02/16/05 11:01 AM Re: Is it worth it??? 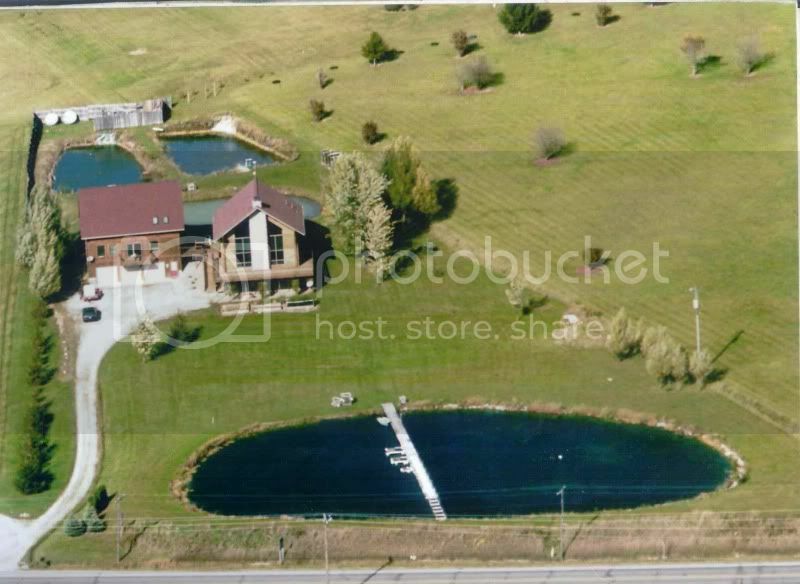 My neighbor and I spent many Sundays talking about building a pond, tucked perfectly between our properties. Almost every Sunday, for five years, we would sip Natural lite as we dreamed up plans to build the pond. Lots of Natural lite. When the 2-acre pond was finally finished, we named her, Lake Natural. #51706 - 02/16/05 11:15 AM Re: Is it worth it??? How did those caged F1 tigers do? #51707 - 02/16/05 04:43 PM Re: Is it worth it??? I released most last fall, but kept five F1's in my cage over the winter, just to see how they would handle a Missouri winter. I left the cage floating at the surface. The cage is 4' deep. The pond froze over a few times, but only a couple inches each time. We have had a mild winter. I only fed them a handful of pellets every two weeks - they just would not eat. I probably should have added bluegill and minnows to the cage. But all the bass survived in the cage. They started out at 4" last spring and are about 10-12" now.